Highflying 'Emerging Markets' Had Their Wings Clipped In 2015 : The Two-Way A weakening commodities market, hindered largely by the slowdown in China, has hurt economies in Latin America, Africa and elsewhere. Brazilian President Dilma Rousseff (from left), Indian Prime Minister Narendra Modi, Russian President Vladimir Putin, Chinese President Xi Jinping and South African President Jacob Zuma pose for a photo during the BRICS Summit in Ufa, Russia, in July. The U.S. economy has improved enough for the Federal Reserve to raise interest rates, but much of the rest of the world remained mired in slow growth and high unemployment in 2015. And the picture was especially grim in the so-called emerging markets, countries such as Brazil, Russia, Venezuela and South Africa. What these places share is that they export a lot of oil and other commodities, and they've been hard-hit by the slowdown in China. A few years ago, emerging markets seemed like islands of prosperity. In fact, they even had their own acronym: BRIC (Brazil, Russia, India and China). 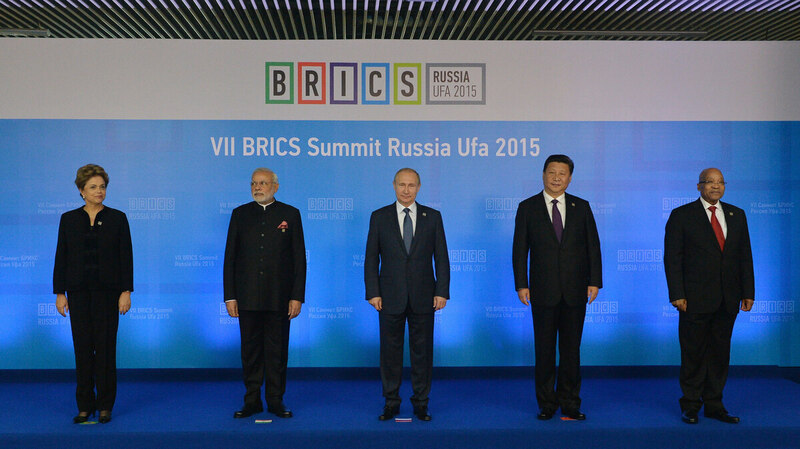 Among investors, BRICs represented the future of the global economy, places of hope and promise. But by 2015, the BRICs had begun to go broke. A steep, unforgiving plunge in commodity prices left most of these countries confronting falling growth, rising unemployment and budget deficits, with no recovery in sight. 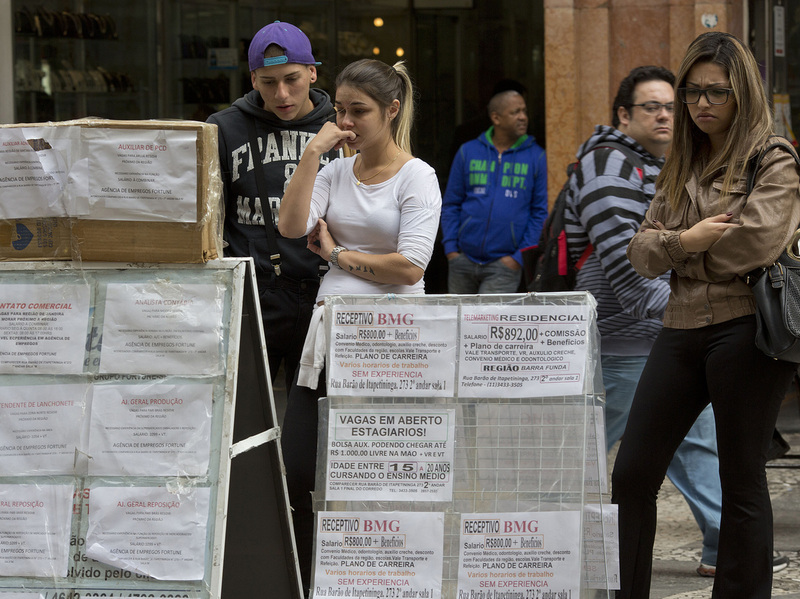 People pause to look at job postings in downtown Sao Paulo, Brazil, last August. The country was especially hard-hit by the slowdown in commodity prices in 2015. "The ones which are particularly badly governed — Brazil and Russia — they're facing possibilities of crisis in 2016. In fact, it's almost a miracle it didn't happen in 2015," says Kenneth Rogoff, professor of public policy and economics at Harvard University. The downturn comes at a time when clouds are parting in the wealthy countries. In the U.S., the Federal Reserve has raised interest rates for the first time in nine years, and both Japan and Europe (with the perennial exception of Greece) enjoy steady, if not good, growth. China is a big reason for this divergence, says Eswar Prasad, senior fellow at the Brookings Institution. "For many commodity-exporting countries in particular, the China slowdown is just one additional turn of the screw that makes it even more difficult for these countries to get back on track," Prasad says. For years, the country built roads, factories, high-speed rail systems, apartment complexes and office towers at astonishing speeds, fueling an insatiable appetite for oil, steel, copper, concrete and aluminum. As China has cooled off, the chill has been felt throughout Latin America, Asia and Africa, and even, to a lesser extent, in developed economies such as Canada and Australia, Prasad notes. "The fact that you don't have strong demand, plus the fact that there is a lot of this supply coming on to the world market, does put downward pressure on prices," he says. The oil market is a big case in point: As new sources of production have opened up in the U.S. and elsewhere, the world has enjoyed a glut of supply. OPEC has been unable to agree on production cuts, which has only driven prices down further, to less than $40 per barrel. With revenues tumbling, even Saudi Arabia is contemplating budget cuts. "We have to accommodate ourselves, our people, our countries to the new reality, that the market will not realize $100 anymore," Abdallah El-Badri, OPEC secretary general, said at the cartel's meeting in Vienna this month. Commodity prices won't keep dropping forever, cautions IHS Chief Economist Nariman Behravesh. "Eventually, it sort of turns itself around. That's the way markets tend to work," Behravesh says. "Production will slow. There's no question. For example, oil production in the U.S. has already begun to slow, and we'll see more of that." As economies such as Brazil have stumbled, they've attracted less investment money; instead, capital is flowing into safer outlets such as the United States — one reason the dollar has risen against virtually every other currency. The stronger dollar is a problem for U.S. exporters, making them less competitive, but Rogoff says consumer demand is keeping the U.S. economy afloat anyway. "The U.S. has very, very solid domestic demand," he says. "The rest of the world is holding us back a little, but it's not enough to put the economy in reverse course. It's still moving forward." The big question for 2016 remains China, Rogoff says. Beijing is trying hard to redirect its economy so that it's driven more by consumer spending and less by big construction projects. Whether or not it succeeds, China is now such a powerful force in the economy that the impact will be felt around the world.